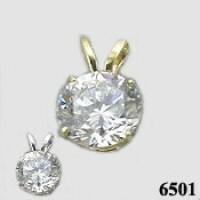 Stock #6501:1 or 2 Carat Charles & Colvard Moissanite Pendant. Gorgeous Charles & Colvard Moissanite! Available in 14k Yellow Gold and 14k White Gold.